Most first-time visitors to Venice spend the majority of their time around its (rightfully) famous Saint Mark's Square. Those with a bit more time in Italy also fit in a visit to Murano, a nearby island. This is the place to go if you're interested in the famed Murano glass, where you can watch a glass making demonstration and maybe buy a Venetian glass souvenir or two. It's got a totally different atmosphere and you'll enjoy it. In case you are wondering, we stayed at Hotel Paganelli near St. Mark’s Square, and it was a perfect location. But if you want to try something a little more unusual, consider staying on the glass island for a while so you can enjoy all Murano has to offer. Or perhaps I should be more precise and say islands. Murano is actually a collection of 7 individual islands, all linked together by bridges. Imagine exploring after the tourists leave for the day! Even if you have limited time in Venice, you can still fit in a quick trip to Murano, as it is only a few minutes' journey by vaporetto. Getting to Murano is pretty straightforward. On our second day in Venice, we walked straight to St. Mark's Square, where we caught vaporetto line 42 to Murano. Unlike our trip to Burano, the weather was cool, with feathery wisps of clouds high overhead. Stepping off the boat brought us to a different world. Here was a quieter, more laid-back island with its own Grand Canal and (of course) fascinating shops and sidewalk cafes. Murano has been occupied since Roman times, and each century brought its own architectural style to the island. They are still there, all vying for attention, and that makes Murano that much more attractive. Unfortunately, our cruise itinerary only gave us a few hours to enjoy what the island had to offer. We couldn't fit everything in, but here's my list of the top things we were able to see. Maybe you'll have more time and can do more than we were able to. 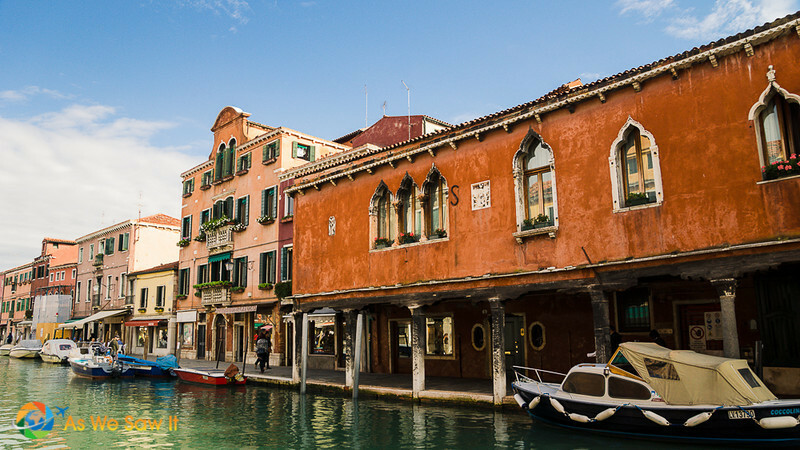 Tip: For an organized excursion, Get Your Guide offers plenty of options with specific start- and stop times, such as this popular Murano and Burano Half-Day Glass and Lace Tour. For more things to do in Murano, check out this page. If you're interested in the art of glass making, Museo del Vetro is for you. This is a history museum that showcases Venetian glass techniques over the centuries, and displays varieties of glass from as far back as Egyptian times. The building itself has served a number of purposes over its lifetime: first built as a patrician's palace, it became home to the bishops of Torcello in 1659, then two centuries later it became Murano's town hall. It only became a museum when Murano was annexed to Venice in 1923. Admission is €10 (some discounts are available). Dating from the 7th century, the Basilica of Saint Mary and Saint Donatus is the duomo for Murano Island. Inside, exquisite, Ravenna-quality Byzantine mosaics cover its floor and dome. Outside, the bell tower, like most bell towers, is separate from the Church. While many churches contain the bones of saints, this basilica contains more than just the relice of St. Donatus. Suspended behind the altar are four rib bones, measuring more than 1 meter long. According to legend, these bones came from a dragon that St. Donatus slew in Greece. Who knows? Maybe it's true. The Roman Catholic Church of Saint Peter the Martyr was built in 1506 and still functions as a parish church. This naked brick building is popular with tourists because it houses the chapel of the Ballarin family, notable for their glassmaking skills, as well as excellent Renaissance art works by artists such as Tintoretto and Bellini. Campo Santo Stefano is best known for Simone Cenedese's ‘Comet Glass Star,' an abstract blue glass starburst sculpture in the middle of the square. Next to it are the Church of St. Stephen and a 19th century clock tower. Both dominate the island and can be seen from far away. Maybe as a result, this is one of the most visited spots on the island. The Palazzo da Mula is one of the last remaining examples of Venetian Gothic architecture. The building was once a luxurious summer residence of the Venetian patricians, who could afford an ornate facade with large Gothic windows. A garden and courtyard made Palazzo da Mula unique among Venetian palaces due to the high price of land in the island empire. As a precaution against fires, the Doge of Venice ordered all Venetian glass makers to move their furnaces (fornaci) to Murano in 1291. This worked out well, as glass was becoming a coveted craft, and this kept the workshops safe. Curious eyes were eager to steal the secrets of the trade. It didin't take long for Murano to become associated with the most coveted and high quality glass in the world. I enjoy watching glass blowers so much that I have been known to completely lose track of time. Better not to start at all, we thought. Only later did we find out that time-pressed visitors like us can take a 40-minute factory tour. *sigh* Maybe next time. Tip: Beware of the scams offering a “free” excursion to see the glassworks at Murano or the lace-making in Burano. You’ll pay for your “free” ride with the grossly overpriced shops you’re escorted to, often at higher prices than you thought you’d agreed to. In the long run, it might be cheaper to pay for a vetted tour guide who will bring you to reputable vendors. This is the entrance to Murano's legendary glass factory Cristalleria. Unfortunately, it closed down in the 1960's. Murano is best known worldwide for its exquisite, hand-crafted glass. If you're not in the market for glass and just want to look, visiting a shop is still fun. Also remember that many glass factories have showrooms where they display their best products. Besides its glass, few other sourvenirs are worth buying as a memento of your visit. Don't waste your time in a souvenir shop. That is, unless you’re in the market for postcards and other standard tourist stuff. Because so many souvenir shops try to pass off cheap Chinese counterfeits as Murano glass, true Murano glass is now protected with a trademark. Look for the “Vetro Murano Artistico” trademark decal in the windows of shops and showrooms that sell authentic Murano glass. Tip: No matter where you travel, never sign a contract that’s not in English, and use a healthy dose of skepticism if anyone offers to “translate” it for you. In addition to these “must-see” things in Murano, there's an even more important “must-do” item you must put on your itinerary: Savor every moment. Avoid the temptation to rush from place to place so you can squeeze everything in. You will miss so much by rushing past the island's many ancient buildings, beginning with all those details that make Murano so uniquely Venetian and ending with the quirky things that its creatives have sprinkled around their island. Murano doesn't just live in its past glory. It has a fun, modern vibe as well. We got a real kick out of these quirky lamp posts. The most precious thing about travel is the opportunity it offers to expand your horizons. It's a chance to see new things, experience new traditions, meet new people, taste new foods. Italy should not be rushed. Take a bit of time to just sit and watch Murano's daily life: exasperated mothers with crying children, excited teens with cell phones in their ears, wizened old ladies walking hand-in-hand with their beloved husbands. Sit quietly in a church for a while and savor its peace. Sip a glass of the local wine and enjoy the waiters' foreign chatter, just because you can. It's all part of the travel experience. This is your trip and your opportunity. Take your time and make the most of it. Venice’s tourist website can be found here. Lodging. You can stay in Murano overnight. We recommend Booking.com. They have a large list of hotels with good rates, user reviews, and you can filter through them all. Travel insurance For the unthinkable: lost bags, delays, injuries, and more. Here’s one to look at. Travel photos. Want to see more of this destination? Click here to view our gallery of photos from Murano, Italy. Airport. The nearest major airport is Venice Marco Polo Airport. Airport code VCE. Other options. This website shows how to get anywhere by plane, train, bus, ferry and car. Peregrine Adventures offers premium adventures, which means embracing the spirit of adventure through a more immersive cultural journey. Hand-picked accommodation, small groups, award-winning local guides, added inclusions and a slower, more considered pace. Premium means an exceptional experience, but never an artificial one. Check out their Italy tours here. If you'd like a done-for-you trip that takes care of all the arrangements. Small groups and responsible travel – that’s their thing. Choose your travel style, from basic backpacker to comfort lover. They have a wide selection of Italy tour itineraries. For shorter tours, we recommend Get Your Guide. We use them whenever we want to book local tours, attractions and activities for ourselves. Thanks for your beautiful review of Murano. It’s my island, I always appreciate when his beauty is narrated around the world. You’re welcome. We’re glad you liked it. Since it’s your island, would you like to recommend any other things to do in Murano? Really beautiful photos! Visiting Murano is definitely one of my favorite thins to do in Venice. Love the detailed post of what see and do on the island! Especially that you mentioned to watch out for the authenticity of the glass – I see far too many people getting caught in the trap. Yes, few things can ruin a vacation like discovering you’ve been cheated. we hope we have helped some people avoid that scam. Very inspirational post, Linda. We visited Murano some years ago, and it was a pleasure to rediscovered these beautiful sites in your post. I remember we visited a glass factory from were we bought some small clocks for my kitchen. They had different, funny shapes. Every single thing they make on this island of so beautiful and delicate! Did you buy any souvenirs too? No, but I saw some beautiful vases so perhaps we will get one once we have a permanent home. Fragile mementos make us nervous, with all our moving about. Visiting the glass factories seems like an awesome experience. It is, and that’s why we included tours as well as DIY options. I’ve been to Venice twice but I haven’t had time to venture to Murano either time. I need to go back! I would love to look at the glass there! Your closing thought about taking time to sit and savor a glass of wine is good for me to read. I travel at fast speed, trying to fit everything in, and get antsy just sitting. But that is the finest way to enjoy Italy, I’m sure! We’re convinced that the Italians have perfected the art of slow living. Somehow, we don’t think of savoring a glass of wine (or a coffee) at a sidewalk cafe often enough. Like you, we try to see as many sights as we can while we’re in a country. If you do return to Venice, be sure to see Burano too. The lace is exquisite, and the rainbow-colored houses keep your camera busy. Speaking of slowing down, Dan spent an hour there walking around with his camera, and I waited for him with wine … We were both in heaven. thank you, Linda. I am planning to visit with my sister and nephew. Definitely, those information will be helpful for me. thanks for sharing this post. Glad you liked it, Naveen. Venice is a poetry. I’m glad I could experience it. Though my stay in Venice was short, I could grasp its essence. You are right, Italy shouldn’t be rushed. It’s so interesting to savor the everyday living there. I’m glad you had a chance to experience its charms, Renuka. Have you been anywhere else that needed time to savor? I love the pictures. Venice appears to be so peaceful, historic and gorgeous. Some of my golf friends have recommended me to make a trip to this beautiful place, but I haven’t had a chance yet. This article has added up to my passion and curiosity in Venice. Thank you for posting and sharing the tips!! Oh, lucky you. We know you will have a wonderful time. Be sure to visit Burano as well, and bring your camera! Absolutely, Priti. That’s what we did. Our stories about Murano and Burano are the result of only one day on each island. It does indeed. We have also been fortunate to visit two other exquisite sites. Moser Glass in the Czech town of Karlovy Vary makes luxury Bohemian crystal and the House of Waterford Crystal in Waterford, Ireland. i have made a film in a glass factory in Murano with a brief explanation of how to do a few pieces of glass. Linda, I enjoyed your blog and video post for Murano. We are headed that way in 32 days (but who’s counting), and found your offerings very helpful in making a final decision to go. It’s certainly nice to see some things other than the glass museum for visiting. The Basilica of Saint Mary and Saint Donatus and its mosaics will make a good primer for our stop in Ravenna later in the trip. We’re figuring that St. Mark’s will be a challenge to absorb. Once again, thank you for some great information. Caio! You’re more than welcome, Mark, and I’m so glad our story has inspired you to go! I’m happy for you and I’m sure you’ll have a wonderful time. We absolutely adore Italy and would live there if we could. By the way, since you’re planning a stop in Ravenna, perhaps you’ll also enjoy reading our article about Ravenna and Her Mosaics. Please do come back after your trip and share any other treasures you discover. I’m sure other readers will appreciate it. I had no idea that Murano was known as the “Glass Island,” but after reading about its glass factories, I can certainly see why it is referred to that way. You listed so many amazing sites that I would love to see on this island, and I can hardly wait to add it to my list of future travel destinations. In fact, I may have to move it to the top of the list for next summer. Other than the glass factories, what would you say is the number one must see attraction or place in Murano? Considering that the island is known for its glass, I’d say the #1 attraction is the glass museum, Audrey. That said, the architecture in Venice is so impressive that Palazzo da Mula comes in a close second. Actually just walking through the streets is an attraction in itself. And speaking of the architecture, if you do go, be sure to visit the more colorful Burano, which is known for its lace. We loved travelling in Italy so much, hope to be back sometime in the future. Perhaps will give Venice another chance! One day in Venice … with kids? In the August heat and crowds? Goodness, you never had a chance to enjoy yourselves! Yes, go at a different time of year and take some time to do nothing. Venice is meant to be savored, in my opinion. Dan and I love wandering through its residential areas. Then again, when you get right down to it, that’s all we’ve ever done. Do you know, we have yet to visit the Cathedral of St. Mark or the Duomo? I keep telling Dan that one of these days we really need to go back and play tourist. You article reminds me when I went to Murano with my partner. It was amazing, we thought to visit an island similar to Venice but we did not know about the beautiful Murano glass. We discovered it there and we literally fell in love with it. I hope one day to go back there and perhaps visit one of the furnaces. So do I. We spent so much time exploring the island and looking at glass shops we never actually visited an actual furnace! Hi Linda! Your post is very useful to me as I’m planning a trip to Murano Island. I would surely visit the 7 must-see places you’ve recommended. Yeah, the island is home of magnificent Murano glass factories and shops that manufacture masterpieces in several varieties. Looking forward to a wonderful time there! Wow! These photos are gorgeous! What a lovely mix of history, architecture, artisan crafts and my favorite, FOOD! Busted. I admit that our lunch was a highlight. Hi Linda, I am planning to go to Venice visiting the Biennale. After reading your blog, I would like to also take the opportunity of going to Murano. I really like Palazzo Da Mula you took a picture of, do you know if it is open for tourists? Actually, I tried to research if it is possible to visit Palazzo da Mula when I wrote the article but I was never able to find out. I hope one of our other readers will be able to answer that question. Somehow I submitted my comment without the rest of what I wanted to say…. I agree totally with sitting back with your glass of wine and truly take it all in. This is our favourite way of enjoying wherever we are. People watch, be present and really take time out to “see” the place. Haha, I thought I caught one of the Wiggles in one of your photo’s! Great photo’s and memories – it inspired my own wonderful memories. My family spent a week in Venice in 2011. I really loved the day we spent on Murano. It was great to have my kids see the glass blowing demonstration, and I did enjoy a bit of glass shopping! Nothing crazy though!